The Huawei P10 and P10 plus were both launched last year running on the EMUI 5.1 which is based on Android 7.1 Nougat. 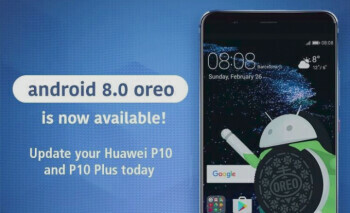 Both devices were however listed to receive the Oreo update and after two months of beta testing, Huawei has finally started rolling out the stable Android 8.0 Oreo update to both Huawei P10 and P10 plus users via Global OTA. Even though the announcement was officially made by Huawei on the company's official Facebook page, no ChangeLog was released. We can however expected the standard Oreo features as well as some other improvements. The EMUI 8.0 update for the P10 and P10 Plus has already begun in the Philippines as reported by XDA members, so it should be available globally in the next couple of days. Also, for the Huawei P10 Lite users, you will also receive the Oreo update pretty soon.